I am using Adobe Lightroom 3.5 (although the issue persistent in previous versions too) and shooting a Nikon D300 with a Tamron 17-50mm f/2.8 (the previous generation, without the built-in motor). When enabling lens corrections it doesn't seems to automatically select the lens (it does so for other lenses though), however when I just set the "Make" on Tamron, all the remaining fields get populated correctly. I'd appreciate hearing back from you. The standard for lens metadata is pretty new, and most cameras/lenses write the data however they like. That means that LR isn't always sure which lens you used, and when it's not sure, it leaves it. When you select the make, you're giving it the clue it needs to guess the rest correctly. 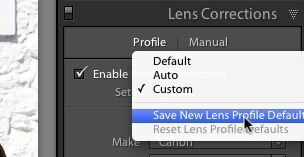 Easy solution - select the right lens profile, and then choose Save New Lens Profile Defaults from the setup pop-up. From then on, LR will automatically select the right lens for that camera/lens combination. While we're talking about it, if lens-profiles are enabled, but lens profile is not found, how about a prompt? I for one never want to have profile-based lens corrections enabled, and then not be notified if the profile does not exist. The profiles are stored with camera raw defaults, but the setting that maps the default when exif-meta is unclear is in preferences, right? That mapping is shared with Camera Raw, so they're not stored in LR's preferences. Same applies to per-camera default Develop settings.